What is a “best friend” on Snapchat, you might ask? A “best friend” is one of three friends on a list that is made up of the people you Snapchat the most. It seems like a useless piece of information to have – who cares who your friends are frequently Snapchatting? As an avid Snapchat user, I must admit that I used the feature on a daily basis and I already miss it dearly. My friends and I would look at other friends’ best friend lists just to see who was talking to who. Here’s why that information is useful: If a friend swore up and down that she was no longer talking to her ex-boyfriend, but her number one Snapchat best friend was her ex-boyfriend, we knew she was lying. Another example: If a friend’s boyfriend told her he didn’t communicate with his ex-girlfriend anymore, but that ex-girlfriend made an appearance on his best friend list, we knew he was lying. See how that works? I’m not saying we should be able to find this information – in fact, I totally admit that it’s creepy. But we were given the ability, and humans are curious creatures. The good news is that this update is probably going to be beneficial to every Snapchat user’s mental health. But if you’re still mourning the loss of your favorite stalking tool, keep your head up. 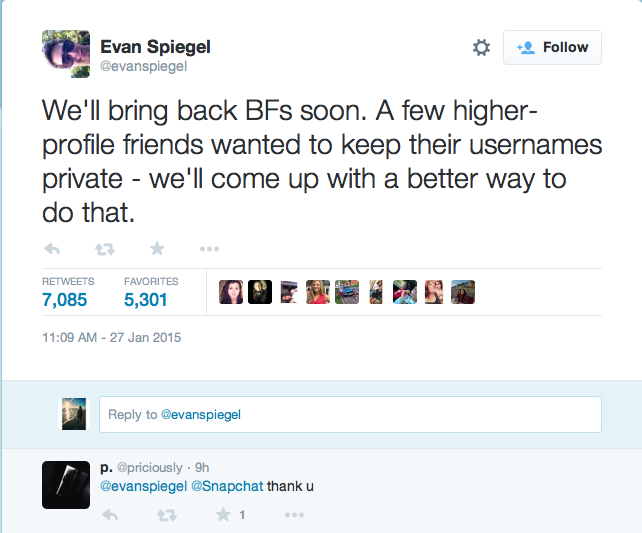 Snapchat’s CEO, Evan Spiegel, said the best friend feature will be back soon. Life between weekends: Not a horror story. You can plan to go viral… or at least increase your chances.